With the proliferation of home computers, the incidence of Internet dating has soared. With the increase in Internet dating, a new type of dating etiquette is in play. The new rules of dating pertain to online meeting and dating. If you meet her on a reputable dating site, are honest in your profile and get the feeling that she's "into you", follow a few rules of etiquette when asking her on your first date. Ask what she plans on doing this weekend. If she talks about how busy she is or makes it clear that she is dating other people, take this as a sign that she is not ready for you to ask her out. If her response indicates she has a part of her weekend open, you can ask her out on a date. Offer to exchange phone numbers with her. She may prefer to talk with you on the telephone prior to meeting you or may hesitate to give her number to a stranger -- either option is acceptable. If she offers her number, ask her for a convenient time to call. Always phone her at the prearranged time, even to tell her that something has come up and you cannot talk for long. Give her feedback if the conversation went well. You can say something like, "I really enjoyed talking with you. Sounds like you are an interesting person." 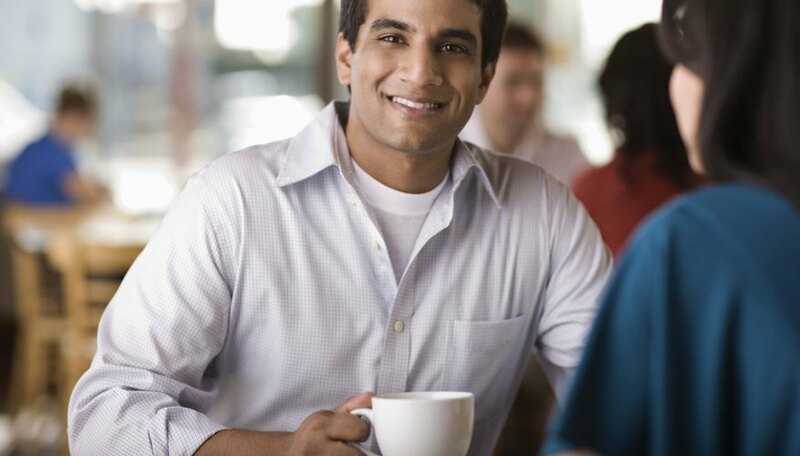 Ask her out for coffee, whether you have talked on the phone or omitted step three. The coffee date is a non-threatening first date that can be an excellent opportunity to get to know her in person. You can say something like, "Sounds like you might have some time on Saturday, would you like to meet for a coffee?" Another advantage of the coffee invitation is that it is on neutral turf -- you don't have to give her your phone number or address if either of you is cautious, and she may feel this is a safe way to get to know you. Research coffee houses that are in a mutually convenient location. Both of your profiles on most popular sites will require you to give the name of the town where she lives. If she expresses an interest in meeting you, give her the name of the mutually convenient coffee establishment and the address. If you are doing the asking, it is considerate for you to offer the location, but be open if she suggests another locale. Scottsdale, Brenda. "How to Ask for a Date Online." Dating Tips - Match.com, https://datingtips.match.com/ask-date-online-13443362.html. Accessed 20 April 2019.